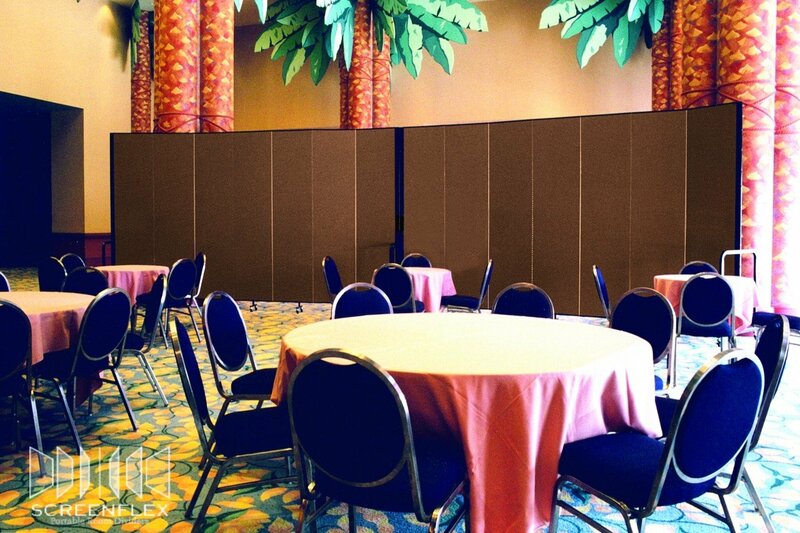 Uses: Banquet Hall, Hospitality Colors: Browns/Tan/Beige Lengths: 7 panel 13'-1" Heights: 6'-0"
A large banquet hall often requires additional food preparation areas for waitstaff to gather items to bring to their guests. This is especially true for larger functions, where this space would be needed for a temporary purpose. This Orlando, Florida facility manager discovered just the solution. Screenflex Portable Partitions are rolled into place to create a decorative yet portable food preparation area for their staff. When the event is complete the walls are either used for another purpose like creating a private dining room or stored in a 2’x3′ space until the next big event.